Everyone certainly remembered his most distinguishing feature. 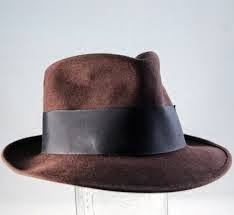 He wore a faded brown fedora. Always. No one could recall ever seeing him without it. It was a part of him. He'd always worn it. Ever since he was young he sported that hat, always at a jaunty angle that made him look older but not too serious. His friends would laugh and joke about it but their ribbing didn't influence him. Still he wore it. It might be sunny or cloudy, raining or windy, day or night. Friends took bets on wether or not he wore that infernal hat to bed. He never let on. It was part of his mystique. That chapeau never seemed to age. It was like it was in a constant state of suspended animation. The hat band bore a thin line of discolouration from sweat which was understandable seeing as how he never took it off. There was a dimple on the right side, more like a crumple where he'd place his hand to tip it ever so slightly when he passed a woman or departed the company of a good friend. And the brim was tuned down at the front casting a shadow over his deep blue eyes. Some thought the hat, and sometimes the wearer, was an anachronism; a throwback to another day and time. After all, people didn't wear fedoras anymore. Yet he did and he didn't really care what people thought. But it was evident people thought highly of him. Those gathered round his faded brown bier spoke glowingly of their dear departed friend. Of his generosity. Of his reliability. Of his sense of humour. Of his dear, dear friendship. And of his hat which now lay on his chest in the open casket. It was the first time, and the last, anyone had seen him without it. It is a good thing...and a great song. Nice job. Glad the hat will make it to the final destination. Thanks for the "hats off" comment, Ref. My stepson is actually the inspiration for this. He wears a black fedora and we call him Leonard Cohen, who also wears a similar chapeau. By the way I want to see pictures of you in those high heels. I agree with the others, this was such a lovely tribute. Thanks, Tara. I seem to have struck a nerve here. I would have wanted to put the hat back on his head before the casket closed. Because your writing put me right there. Aw, thanks. I thought of that but didn't think it would look right with the back of his head on the casket pillow. But he did get to take it with him.